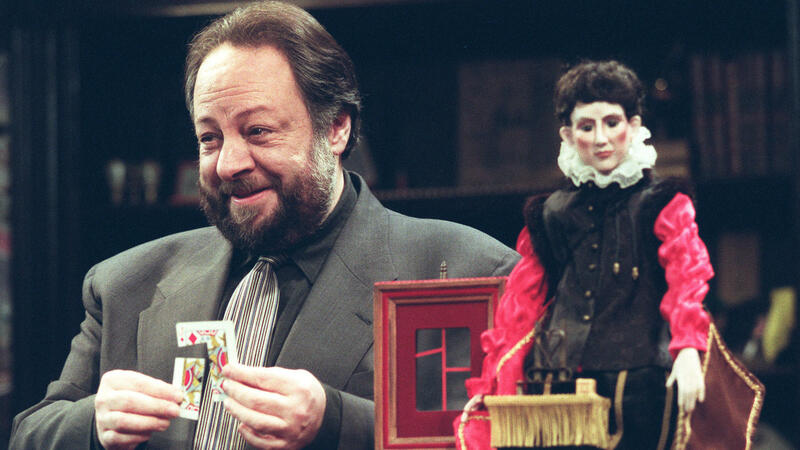 Ricky Jay performs his show Ricky Jay & his 52 Assistants at the Tiffany Theatre in Los Angeles in 1996. There are hundreds, maybe even thousands of people in the world who would've thrilled at the opportunity to spend time in the close orbit of Ricky Jay, the illusionist, writer, performer, playing card-thrower, and scholar who died at his home in Los Angeles last weekend. At the beginning of 2005, when I went to work for him, I was not one of those people. Maybe that counted as a credential. Personal assistants can't be starstruck, certainly not by their own bosses. But when I met him I was only dimly aware of Ricky's extraordinary work as both a historian and benign practitioner of illusions and cons. I knew his face from his performances in the movies of his friends David Mamet (House of Games, among others) and Paul Thomas Anderson (Boogie Nights), and from the 007 flick Tomorrow Never Dies, from which his card-throwing scene was inexplicably cut. RJ and I had a mutual friend in Deborah Baron, to whom I had become close after I showed up in her UCLA screenwriting class in 2002. Now and then, when Deb and I were walking her dogs or catching a movie at the Writers' Guild — she a member; I her guest — she'd mention that she wanted to introduce me to Ricky, her genius magician pal. He was, like her, a New Yorker who'd gone west in the '70s, when (she told me) the smog was worse but everything else was better. She'd referred a prior student of hers to RJ, who had hired him as an assistant for several years. When I finally met him, it was to interview for that gig. And a gig is what it was. My degree of employment fluctuated from week-to-week as RJ's needs dictated. It's a cruel irony that my memory of spending eight months in the service of the man who was likely the most singularly talented person I'll ever meet is so spotty. But it's also a sort of defense mechanism, because I was anxious wreck for most of that period. I'm afraid that makes it sound like my boss was a tyrant, which he was not. Anyone who knew RJ would tell you he could be gruff sometimes, but he and his wife, the movie producer Chrisann Verges, treated me with kindness and were tolerant and forgiving of my errors and defects, which were plentiful. I was in rough shape that year: A few months before RJ hired me, I'd been fired for the first and only time in my career, from a job I'd worked hard to get. Soon after that, my relationship with the partner with whom I'd been living for four years came to an end. My twenties were growing scarce, I was broke, and I had no reason to believe I'd ever earn a living from writing or from any other line of work for which I could muster interest or enthusiasm. I was in a poor headspace to absorb whatever lessons might be gleaned from just being around a guy like RJ, who had managed to turn his peculiar obsessions into a career free of compromise. What did penetrate the cloud of gloom I walked around in was the realization that he had done, or was doing, so very many things that I wanted to do: He'd written books. He'd consulted on and acted in movies. He'd had a hit solo show off-Broadway in Ricky Jay and His 52 Assistants, and then another called Ricky Jay on the Stem. In 2003 and 2004, he'd hosted a weekly four-minute segment on KCRW, the cool Santa Monica public radio station that film and TV music supervisors listened to to discover up-and-coming musicians. He would simply read an essay he'd written on some bizarre performer from centuries past. (His favorite was Matthias Buchinger, a famous German magician, card sharp, "micographer" and trick shot artist whose resume was all the more striking given that he'd been born without hands or feet, and was only 29 inches tall. Ever the overachiever, when Buchinger died in 1740, he was survived by 14 children.) He'd had a recurring part on Deadwood, the best show on TV the previous year. And yet he would tell me many times during my engagement that show business was no way to make a living. "If you can possibly be content doing anything else, you should do that," he'd say. These were not pep talks. My silent knee-jerk response was predictable: Ricky and Chrisann lived in a beautiful house, which was where I worked when I wasn't running errands for him in my car (a Toyota Corolla) or driving him around in his (a black BMW). I was sharing a three-bedroom apartment in Studio City with a bartender/improv comic and a production assistant for commercials (not features; she was explicit on this point), for which I paid $575 per month. But that's something that's struck me over the past few days as I've reflected on my time with RJ: Even someone as talented and admired as RJ was — this artist-scholar whose skills and manner of expression made him almost literally one-of-a-kind — even he stressed about bills. This is a subject he alights on in both Mark Singer's definitive 1993 New Yorker profile of him, and in the 2012 documentary Deceptive Practice: The Mysteries and Mentors of Ricky Jay, which was inspired by that magazine story. His grandfather, Max Katz, the man most responsible for the fact that RJ was performing magic professionally by the time he was seven (Deceptive Practice has clips) was the accountant to Slydini, one of the magicians Katz had hired to teach him their secrets and then befriended. He introduced Slydini, Al Flosso, and others to a very young Ricky. Katz knew, and he made sure his grandson knew, that even great practitioners of the art were paupers. "I never stopped thinking about that," RJ says in Deceptive Practice. "The people who were so good that they would bring tears to your eyes, tears of joy from the beauty of their performances, couldn't make money." But some riches are worth more than money. RJ seemed to be on friendly terms with half the creative people whose work I'd ever admired: I can remember one afternoon, early in my tenure, sitting beside him at his kitchen table jotting down to-dos as he opened his mail. He'd recently sent out copies of his latest book Extraordinary Exhibitions, and the signatures on the thank-you cards coming back fairly blew my mind: Michael Chabon, Steve Martin, Tom Waits. I remember sneaking a look at Waits's note and taking great satisfaction from my discovery that his illegible scrawl seemed a perfect match for his speaking voice. Some weeks later, Paul Thomas Anderson, who must have been working on the screenplay for There Will Be Blood that year — rang the doorbell, accompanied by his spouse, Maya Rudolph. They had come to pick up RJ and Chrisann for a concert their mutual pal Bob Dylan was playing at the Pantages Theatre. With Zen-like cheerful disinterest, I invited them to come inside and wait. I was, let me be clear, a lousy assistant most days. I was polite and eager-to-please, but also disorganized and frequently bested by the vagaries of Los Angeles traffic patterns. I was shy, as well — this despite the fact I'd had vague ambitions of becoming a reporter of "narrative nonfiction," as I told RJ in my interview. For whatever reason, he glommed onto the phrase, and would tease me about it occasionally when he was in a good mood. This struck me as odd, given that he was friends with plenty of people who wrote exactly that. Being an assistant turned out to require at least as much talking-to-strangers as the work I'd done as a reporter up to that point. And I'd have to ask them about things I'd been unhelpfully conditioned to believe were impolite to discuss, like money, and perks, and also money. Being a personal assistant to a magician is not the same thing as being a magician's assistant, though people would ask me, not always in jest, how RJ did his tricks. Of course I would never disclose any of his secrets — a promise as sincerely felt as it is meaningless, because I was never privy to anything like that. People who worked and socialized with him for decades didn't know, and knew better than to ask; he believed in keeping that kind of hard-won expertise within the fraternity of magicians. RJ and his his vanishingly few peers — his friend and business partner Michael Weber, for instance — were selective as to what they chose to share even with one another, and when and under what circumstances they would share it. All I can do is reiterate RJ's own candor on this subject: Although he certainly believed in luck, nothing he ever did for an audience was supernatural. It appeared that way because he practiced his marvels in private until he could perform them in a way that was, to borrow Arthur C. Clarke's adage about advanced technology, "indistinguishable from magic." I'd only been working for RJ for a couple of months when he accepted an offer from the Studio Theatre in Washington, DC for a four-week run of 52 Assistants, which in the 11 years since its off-Broadway engagement, he had performed at the Old Vic in London and in many other cities. He didn't anticipate needing me, but I persuaded him to let me come along because I'd be cheap — I'd stay with my folks, out in the Virginia suburbs. One of my tasks was to manage the ticket requests that came in from friends and acquaintances of RJ who either lived in the area or planned to travel there to see him perform for the first time in a few years. I would also discreetly approach his guests or other VIPs in the audience at intermission and invite them for a brief backstage visit at at the end of the show. One night, Associate Justice Stephen Breyer attended with his wife. After that performance, I came into the green room with a stack of Ricky's books for RJ to sign. If so signaled, I could make it look like this was a chore that would, regrettably, require his guests to depart. But I could see that RJ was enjoying his conversation with the Breyers, and that I should not interrupt. The Justice said something like, "I just don't know you do that." RJ and Chrisann had both noticed, with seeming amusement, that I'd developed a crush on one of the house managers at Studio. It tells you plenty about my personality at that time that this woman had to ask me out, but I'd been happy to report to my bosses that she had — a rare piece of evidence of my competence at something. Anyway, in response to Justice Breyer's compliment, RJ said, "I've been doing this since I was four years old." He added, rhetorically, "How do you get to Carnegie Hall?" Sleep with the house manager, I thought. I realized too late that I had, in fact, thought this thought out loud. I began thinking about my resume. But the Justice... was laughing. So was Mrs. Breyer. My boss was laughing, too. And so my engagement with him survived another shift. Most of my workdays did not involve telling mildly off-color demi-jokes to luminaries of jurisprudence. I collected the mail from the Sunset Boulevard office of one of his longtime associates. I walked Boswell, their sweet Burnese Mountain Dog, or rather he walked me — he was an extremely strong dog. I fixed RJ's iMac when it acted up, which it often did — as was fitting for a man who loved paper and writing instruments as much as RJ did, his relationship with digital technology ranged from icily cordial to openly hostile. I filed his press clippings and correspondence. I tried, unsuccessfully, to set up a wireless network in his house. That was a more complex task 13 years ago than it is now, made more difficult by the thousands of books lining his walls. A good assistant should be efficient and invisible. I occasionally succeeded at the latter. Starstruck-ery opportunities abounded: I remember Ed Norton coming by the house once to discuss the screenplay for The Illusionist, one of two period-magic movies RJ consulted on released in 2006. (He has a small but crucial part in the other one, Christopher Nolan's The Prestige. It's a great movie.) Norton was the only movie actor I ever met who is taller in real life than he appears onscreen. Either Chrisann or Ricky told me later that Norton had told them he'd ushered at Second Stage Theatre at 76th and Broadway during 52 Assistants back in 1994, because it was the surest way to get into the show, and he wanted to see it as many times as he could. I got to see the show, or at least hear it, I think 20 times. RJ did not perform matinees, and I was there every night save one. The second act climaxed with him throwing cards into watermelon, first the squishy interior, then the "pachydermatic outer melon layer." It was the same stunt he'd performed on the 1989 TV special extrapolated from his book Learned Pigs and Fireproof Women. (That clip, too, is featured in Deceptive Practice.) It always killed. The card throw is a violent, physically taxing movie, and he was often out of breath by the time he'd fired six or eight shots (his word). One of the local stage crew, who remains a good friend of mine, still likes to tease me about how she had to go out and buy watermelons each afternoon before the show. Behind every transcendent, unforgettable performance is a deeply ordinary chore. With thanks for battling in the attics, basements, theatres and trenches with the author. That book is one of my most cherished possessions. I'm certain that "battling" was the correct verb — I spent a lot time that year trying to get things done for my boss. I fled Los Angeles, and I eventually started earning a modest living pursuing my genuine interests, which while not quite as arcane as RJ's, are still specific and weird. I saw RJ and Chrisann on three occasions in the years after I came back east, and each time they said they were pleased by how things had been going for me. It meant a lot. It's been thirteen years since I worked for Ricky Jay; I still worry about money like he did, like most people do. But now — also like him — I'm doing work I like doing. I get to write for a living, I do radio and podcasts sometimes. I dutifully heeded his advice — I'm not in showbiz — but I do think and talk and write about theater and films and television a lot; I'm showbiz-adjacent. I've made a place for myself in the wings, behind the scenes, in the audience, watching performers like RJ do their work. It's a place, I now realize, a lot like the one that circumstances made for me, back when I worked for him — with one crucial difference. I'm happier now than I was then. He helped get me here, and I'm glad I knew him. That's all.